Chesterfield Islands (îles Chesterfield in French) is a French archipelago of New Caledonia located in the Coral Sea, 550 km northwest of Grande Terre, the main island of New Caledonia. The archipelago is 120 km long and 70 km broad, made up of 11 islets and many reefs. The land area of the islands is less than 10 km2. 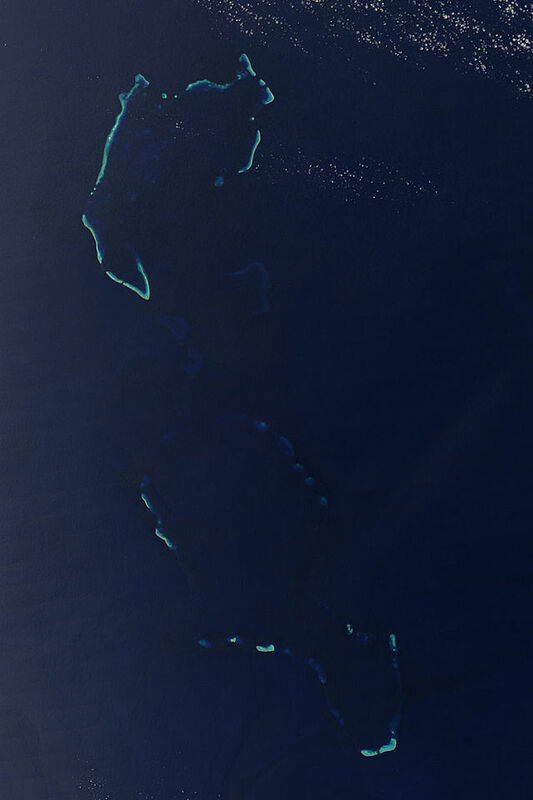 The Chesterfield Islands, sometimes referred to as the Chesterfield Reefs or Chesterfield Group, are the most important of a number of uninhabited coral sand cays. Some are awash and liable to shift with the wind while others are stabilized by the growth of grass, creepers and low trees. The reefs extend from 19˚ to 22˚S between 158–160˚E in the southern Coral Sea halfway between Australia and New Caledonia. The Chesterfield Reefs are now part of the territory of New Caledonia while the islands farther west are part of the Australian Coral Sea Islands Territory. Chesterfield lagoon, located between 19˚00' and 20˚30' S and 158˚10' and 159˚ E covers an area of approximately 3500 km2. This lagoon is surrounded by a barrier reef interrupted by wide passes except on its eastern side where it is open for over 20 nautical miles (37 km). The major part of the lagoon is exposed to trade winds and to the southeastern oceanic swell. The lagoon is relatively deep with a mean depth of 51 m. The depth increases from south to north.